It was almost too cold to get into the garden this past Sunday, but, I made myself dress warmly and head outside to see what effects the 45 degree drop in temperatures had on the early blooming daffs. I'm so glad I did there were just enough blooms to make me smile and to share on GBBD. Shall we see what was out there? The sky was brilliant blue and the witch hazel, Hamamelis x intermedia 'Diane' had unfurled her spidery crepe paper petals like solar collectors. She was in full sun receivership. Waiting for pollinating visitors. Even the marcescence leaves could not detract from her red flowers against the deep blue winter sky. There's speculation that the leaves that cling until after the last petal folds up for the season actually help protect the blooms from foraging mammals but, I wonder if they might protect the delicate looking flowers from the bitter cold winds that often arrive when they begin to bloom. Hamamelis vernalis is also still in bloom. It has the most unusual orange/yellow/reddish coloring on those amazing crepe paper streaming petals that furl and unfurl as the temperature falls and rises. They perfume the garden with their sweet vanilla scent on warm days. I planted them for that fragrance and once you smell them, you will, want them in your garden, too. I love that not only do winter blooming shrubs and trees flower for months and months, they almost always have some fragrance. How clever of Mother Nature to give winter bloomers that something special to insure that a little fly, gnat or bee will follow the scent and pollinate the flower. The hellebores are in full bloom~Not even temps in the teens can stop them from showing off their pretty petals. My favorite right now are the doubles. Oh, aren't they pretty! Both are from Marietta O’Byrne's (Northwest Garden Nursery in Oregon) Winter Jewels™ strain of double hellebores. They are gorgeous, loved and welcomed in my garden every time they bloom! Although my heart belongs to native plants, I find much to commend these beauties. I've decided to move them all to their own hillside where they will get the good drainage they love....More on that later. I'm not sure why I was surprised to see a few Tommies standing tall on the hillside. They aren't called snow crocus for nothing. These delicate looking flowers bloom early and are unfazed by the cold weather winter seems to throw at them. I'm hoping that the thousands I've planted will all be blooming before too long. 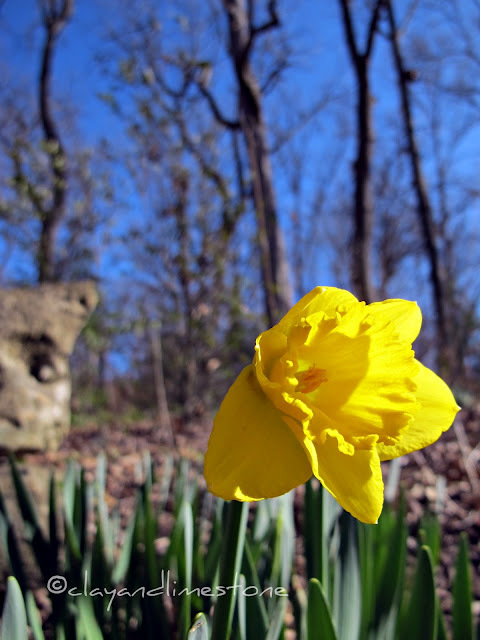 The earliest blooming daffodils were up and nodded good afternoon to me as the sun moved further into the western sky. I hope you enjoyed our little tour and have a marvelous Bloom Day. How lovely everything looks against that pure blue sky, Gail! A native witch hazel may be in my future at some point, you are such a good salesperson! The double and fancy hellebores are exquisite gems, natives or not. How beautiful! I was trying to see if there was any sign of bloom on the witch hazel I planted last year, but I'm not sure if I even have that tree this spring. 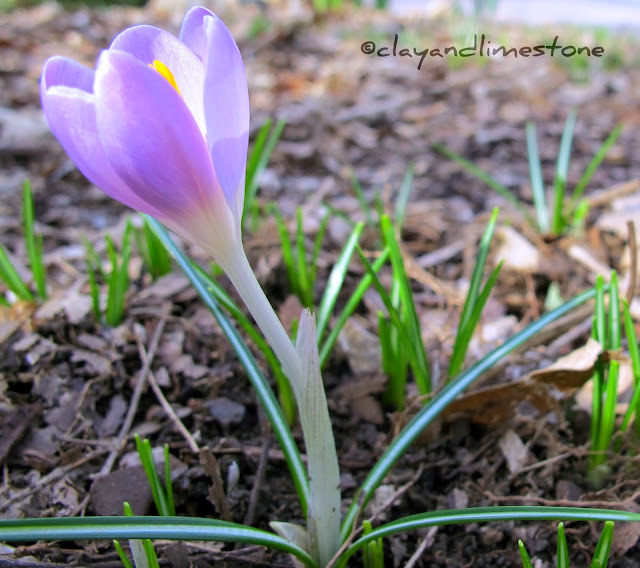 Spring is clearly on the way at Clay and Limestone, Gail! 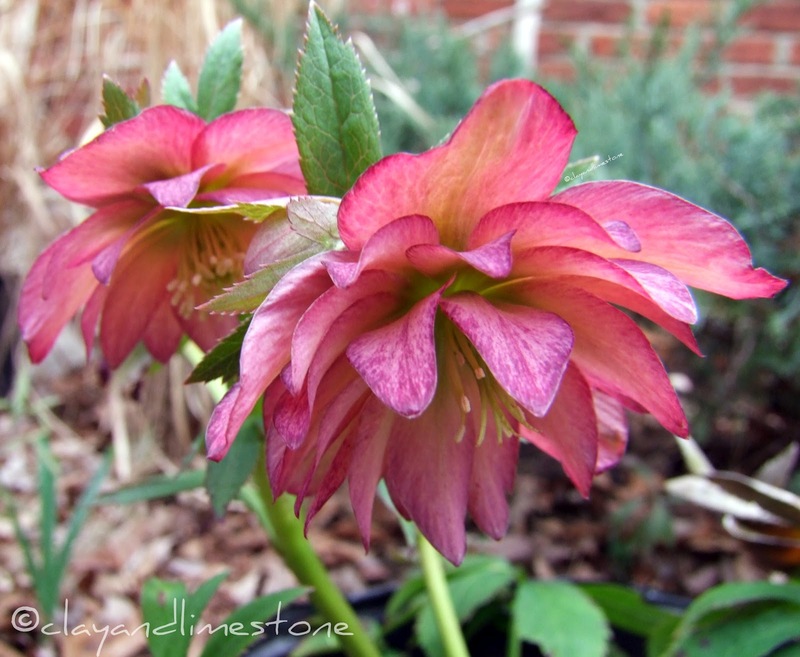 I love the color of your pink double hellebore! And, as Frances says, everything is so lovely against that pure blue sky. Happy Bloom Day! Ooh! I am drooling over your hellebores. Such fabulous colors. I added one to my garden 2 years ago but must look for the ones you have. They are stunners. That first image with the blue and yellow is a show stopper. I have been thinking of adding some of those double Hellebores and you've convinced me I should. Still winter up here; mild, but nothing happening outdoors yet. Those hellebores are lovely! I have only one and it pales in comparison. I may need to rectify that situation.It looks like spring is truly on its way at C and L! Wow, look at the size of that 'Golden Lotus'! Hellebores grow quite well for me, and I'm adding more every year. The bottom of a slope would be a good place to see those nodding blooms. I'd forgotten it's the 15th -- only snowdrops growing here, but I'll go out and see if I can snap a decent picture. Happy Blooms Day, Gail. Oh, the double pink hellebore is dreamy! I can't wait for hellebore season to start here. I have to question that theory about the witch hazel leaves deterring predation. I can't see how the leaves would deter any hungry critter, it's not like they're spiny or stinky. How wonderful it is to see that spring is on its way. Your garden looks so lovely, especially the Helleborus...wow. Gail do blow some of your warm air up to me. I was sitting here just admiring the daffodils set against that beautiful blue sky and the witch hazel, and then you showed those hellebores! Oh my, I have a terrible case of plant envy now--those double blooms are just gorgeous. Looks like spring is on its way to you, Gail. I am supremely jealous of your Witch Hazels...especially 'Diane'! I wish I had room for them...I went to the nursery this weekend and had to keep reminding myself I didn't have room...it was so tempting to buy one! Happy GBBD to you too Gail. Love those Witch Hazels. When I see them I remember the first time I ever saw one in the wild. I was amazed. I am amazed each time I see one. Wow! Double Hellebores! I did not know they existed. They are so beautiful! I love that back view of the daffodil, too! Wasn't it a beautiful day, today, for those of us in the Southeastern US? A bit warm, perhaps, for this time of year, but fabulous, nonetheless. And phooey, I just remembered that it was wildflower wednesday, just after posting about native woodland gardens (and oh, I guess it's GBBD day, too -- hmm, I'm out of step, to be sure). Our natives are waking up now, so it's a joy to be out in the garden and in the woods, as well as enjoying all of our Asian species and Mediterranean bulbs. Lisa, WW is not till next week! You've got time! Those double hellebores are real winners! We have two doubles blooming and another two on the way to opening. I'd move those hellebore plants in the fall once the heat is finished. I am in love with your double hellebores! Why oh why don't I have any in my garden? I must take care of that immediately! And why have I never added witch hazel? I think I need to cash in a few of my favorite nursery gift certificates. Your photos are lovely--thank you for sharing. Happy GBBD! Beautiful blooms! You captured the Witch hazels beautifully. Sometimes those blooms are hard to photograph. Love your little bee and the flying carpet cliparts. The double Hellebore is really pretty and the yellow one must stand out in the landscape! Beautiful collection, Gail! I love all your creative angles for the flower photos. Happy GBBD from Texas. Your blooms are especially beautiful against that sapphire sky...amazing! I am in love with your hazels! Mine is small and now wrapped in chicken wire only after a pretty good pruning by rabbit. What wonderful spring blooms! Here up NORTH I actually spied two crocus peeping up - in FEB? I cannot wait for spring! Wow Gail. It's looking a lot like spring in your garden. 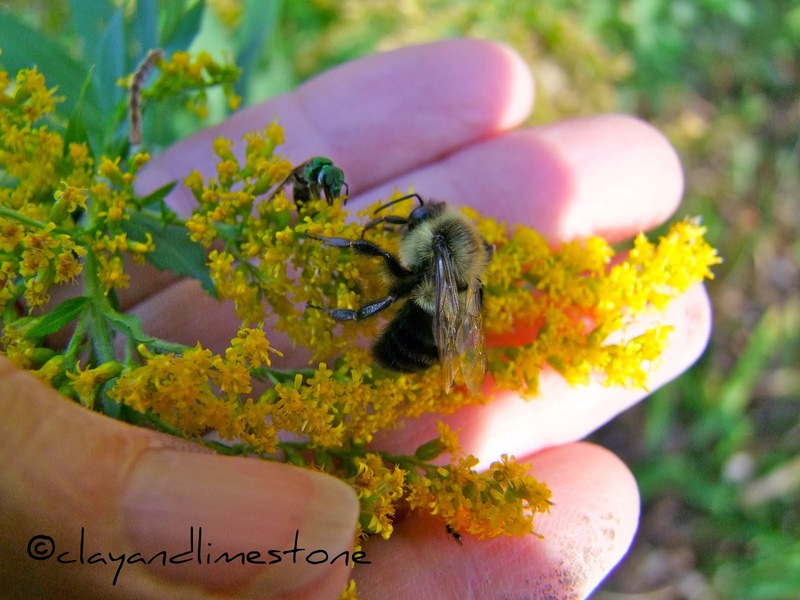 I hope you don't mind, I had to "pin" a few of your photos on my "Plants Up Close" Pinterest board. Absolutely gorgeous! The winter blue sky is a color all it's own, is it not? Your photos are gorgeous and boy howdy! I like that lime colored hellebore. I find it quite interesting that your daffodils are out before ours this year! 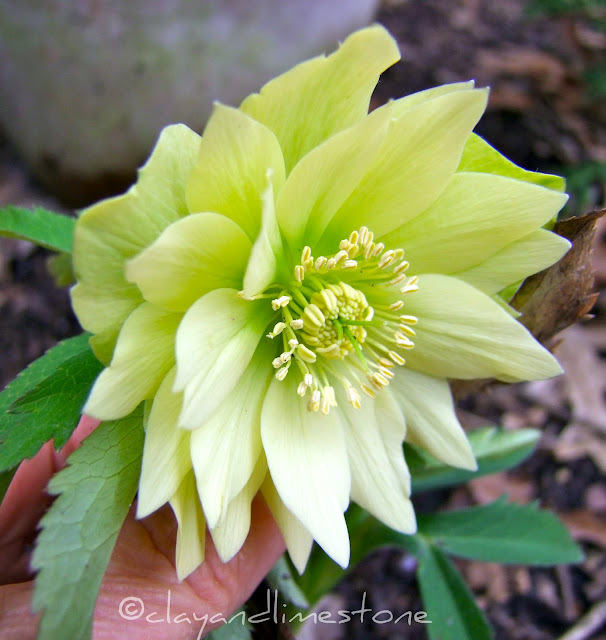 I was so desperate to see something (other than the rosemary) in bloom, I broke down and purchased my first Hellebore yesterday ;) I know spring isn't far away though, and looks like it's already found you! Sometime I am going to have to make myself a little chart, comparing C to F temps, it's hard to remember what cold is in F anymore...we are so used to C.
But your sky! oh how blue. This post settles it, I must get some double hellebores. Just catching up Gail...I adore your blooms and that sky...we have snow again so no blooms yet...I fell in love with Hamamelis vernalis when I saw it on your blog last year and I am determined to add it to my garden this year...happy belated GBBD! My hellebore is a seedling given to me by a friend and it's still too tiny to bloom. She and I have no idea what color it will be so I'm looking forward to that surprise. Your witch hazel is beautiful! The petals look like party streamers. Maybe they're on to something we're not? 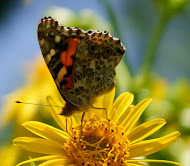 :o) I have some natives on my current post that might work in your garden. Hooray for an early spring, and that fabulous blue sky! Wow. Those rose colored hellebores are spectacular! Thank you for sharing them! Inspiring! I love your witch hazel pictures, Gail! So pretty against the blue sky. :-) Happy GBBD! Brilliant blue skies indeed! Our daffs are blooming here too, a month early. I love your Witch Hazels. Mine finished blooming a couple of weeks ago. I think I need more!